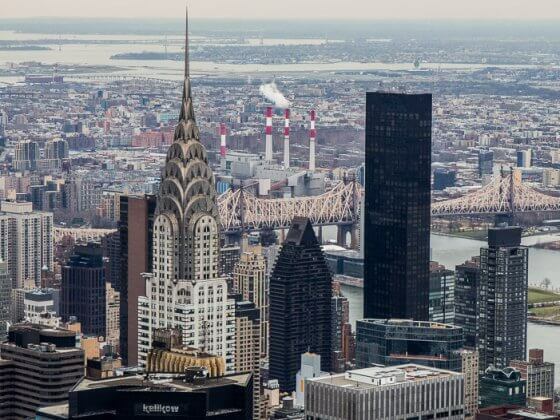 Are you planning a trip to the USA and New York City? Maybe at Christmas time? To be honest, I never really get excited about Christmas, nor have found it too magical, until I visited New York for Christmas and New Years Eve in 2004. We enjoyed a two week trip to New York City with the girls, and was wrapped up in the magic of the Christmas spirit again. 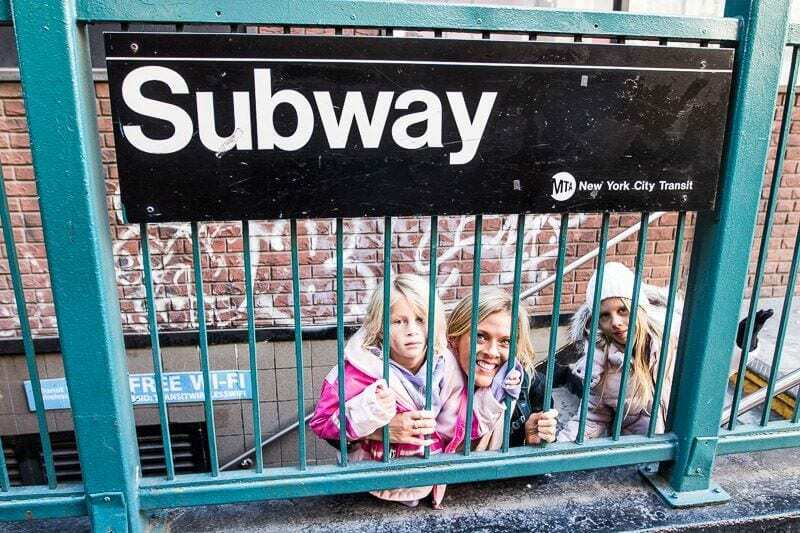 Experiencing Christmas in NYC with kids is like having whipped cream on your hot chocolate! From tree lighting ceremonies to magical shop window displays, to ice skating to Christmas tunes and Santaland, there are endless magical things to do in New York at Christmas. 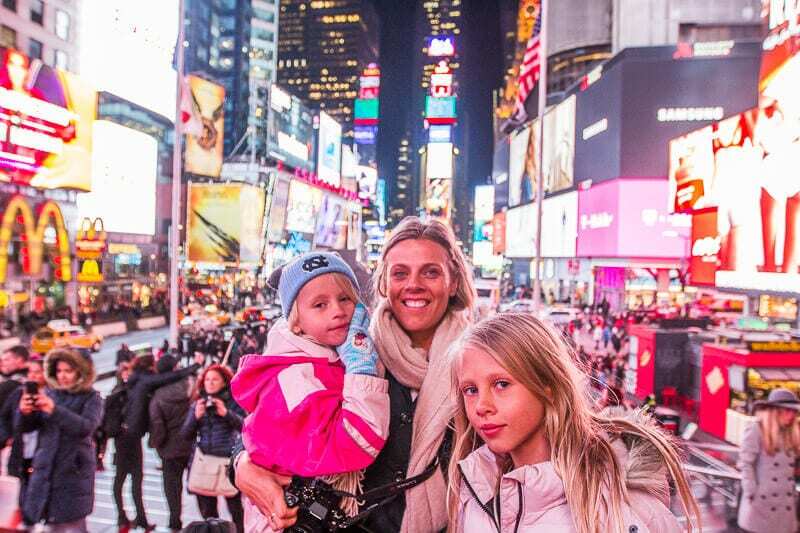 This time we traveled a little earlier in the season at the end of November and beginning of December to experience the lead up to Christmas in New York with kids. This time of year is when the tree lighting ceremonies start, the Christmas lights and decorations are turned on, and the crazy Thanksgiving sales are still lingering. 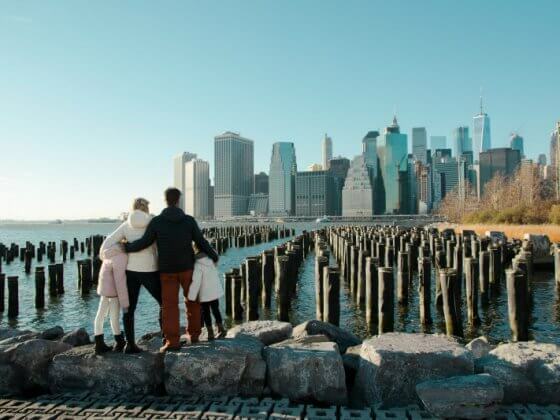 This is the first of many posts we’ll be writing offering tips on things to do in New York and travel saving tips – Join our email community so you don’t miss them. 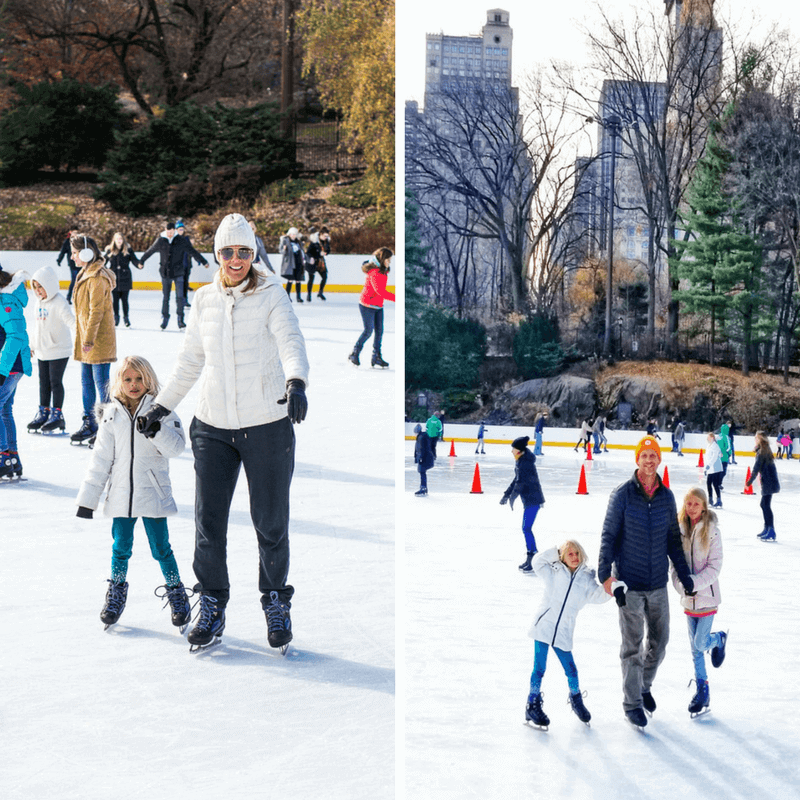 In this post, I’m sharing just the Christmas holiday related things to do in New York. Note that all major New York City attractions will be decorated in the festive spirit. So it brings a new experience to the likes of the Empire State Building and One World Observatory. 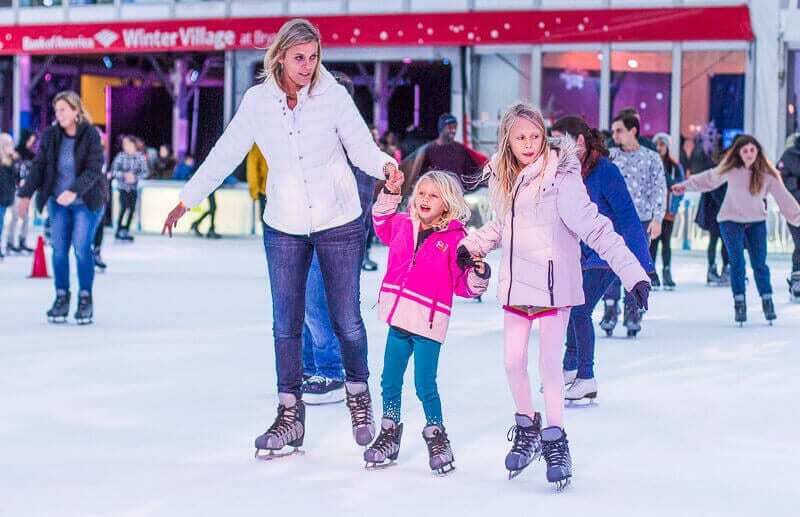 All of us at yTravel agree that ice skating in Bryant Park was the most magical Christmas experience in New York. I think even outside of Christmas and winter, Bryant Park would be one of my favorite New York places to visit. It was the most recommended activity from our community as well. Bryant Park is this delightful square surrounded by the New York skyscrapers, including an eye catching American Radiator Building, and the New York Public Library. 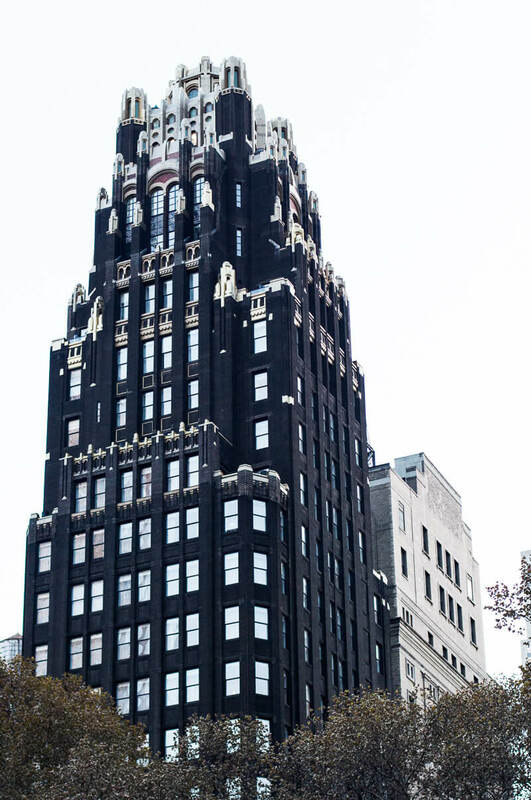 The American Radiator building’s black and gold facade is striking and makes it one of my favorite buildings in New York. It is now the The Bryant Park Hotel. 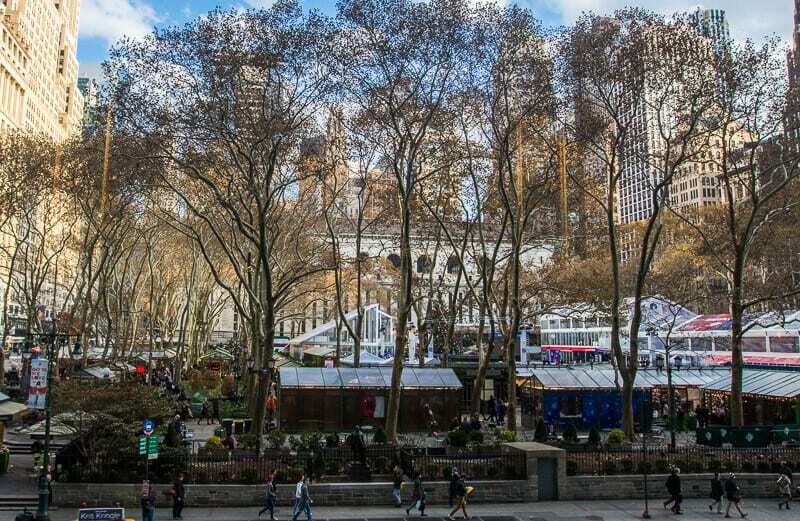 During Christmas in NYC, Bryant Park also has the Winter Village, which has the ice skating rink, a giant Christmas tree, and food kiosks. You can sit on the edge of the rink and watch the kids (after you’ve had fun skating with them) and sip on a hot chocolate or glass of wine and enjoy the Christmas music. Of an evening they have a live band playing the tunes. I loved the experience with the girls as they tried ice skating for the first time. It was wonderful to watch Kalyra step out and get it straight away, and for me to spend time with the more cautious Savannah guiding her on the ice and helping her gain the confidence to let go. It was such a treat to see it when she finally did. She was scared of falling over but once she did it once and realized it was part of the ice skating experience, and no one else laughing at her, she was happy to fall over and over again. Kalyra and Savannah were happy to stay on the ice while we watched them from the deck of the Public Fare while meeting up with old friends and getting to know new ones. 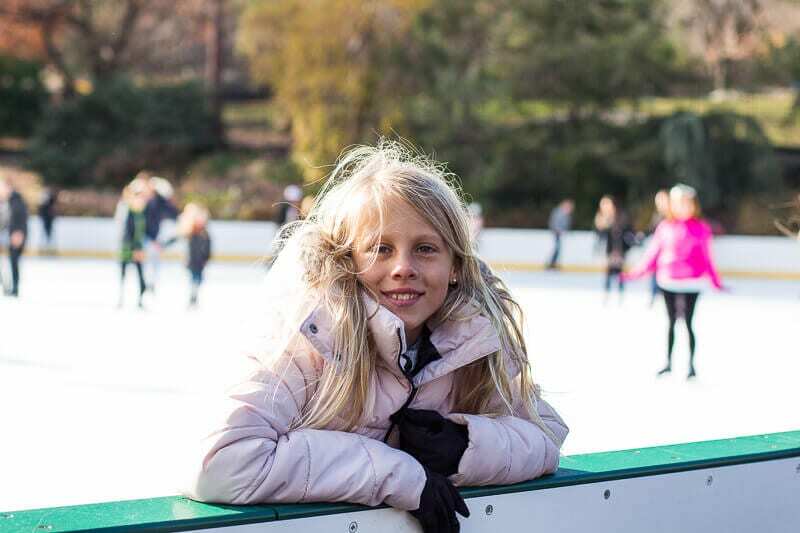 They stayed on the ice for three hours and every day after asked if they could go ice skating at Bryant Park again. They did one more time! If you have your own skates, it is free to skate at Bryant Park, otherwise its a $20 fee to rent the skates, which you can have as long as you like. I recommend getting to the rink mid-afternoon as it does get very busy after 6pm. In between the skating, you can also check out the artisan Christmas markets in the open air village selling jewellery, decor, home wares, Christmas gifts and local food and drinks. I would also have a drink by the fires at Southwest Porch, a spot we didn’t discover until after our meet up! It looks gorgeous and apparently is opened year round. 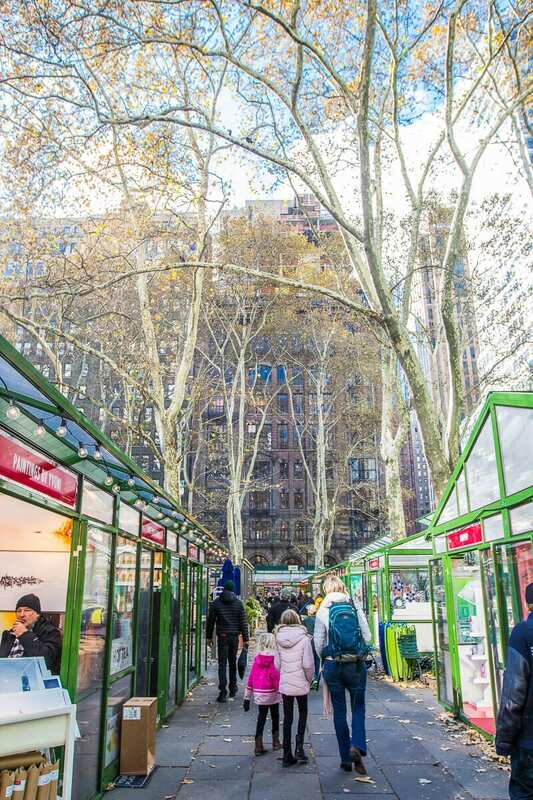 Bryant Park is only a short walk from Times Square so we recommend skipping the flashing neon light madness there and relaxing amongst the charm of this holiday Oasis. If you want GREAT coffee, around the corner from Bryant Park you have Culture Espresso (best coffee I tried in NYC) and Bluestone Lane – an Aussie café. Pick up some Vegemite toast and a lamington while there. Click here for more great coffee spots the locals love. 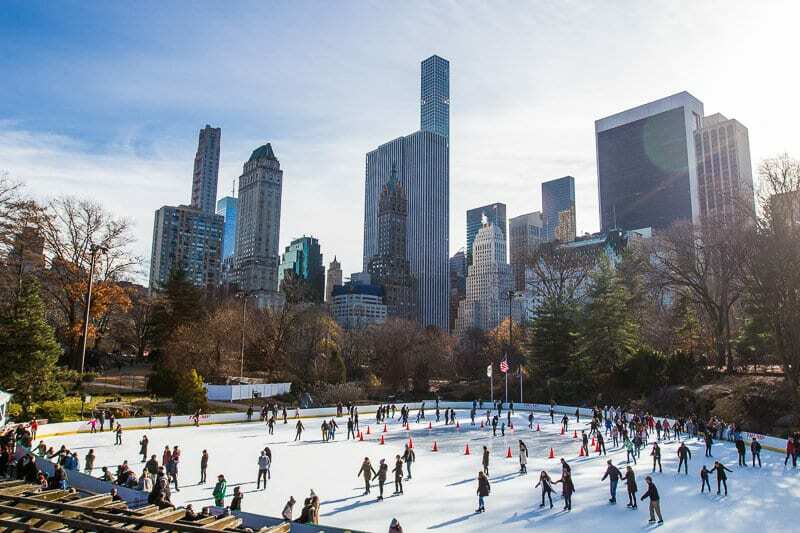 At the Wollman Ice Skating Rink in Central Park, you’ll have a stunning backdrop of the New York Skyline, Christmas music and possibly the presence of Santa Claus. It is the larger skating rink out of Bryant Park and Rockefeller. Although that backdrop is pretty, and you’re in Central Park, it does not have the same magical and warm spirit that Bryant Park has. Prices for adults increase to $19 on the weekend AND there is a $5 spectator fee. (Another reason why Bryant Park is better). Depending on how many kids you have, it could be cheaper or more expensive than Bryant. For, us it was around the same price. You can go above to the viewing platform to avoid this however. Probably not a good idea if you have young kids. 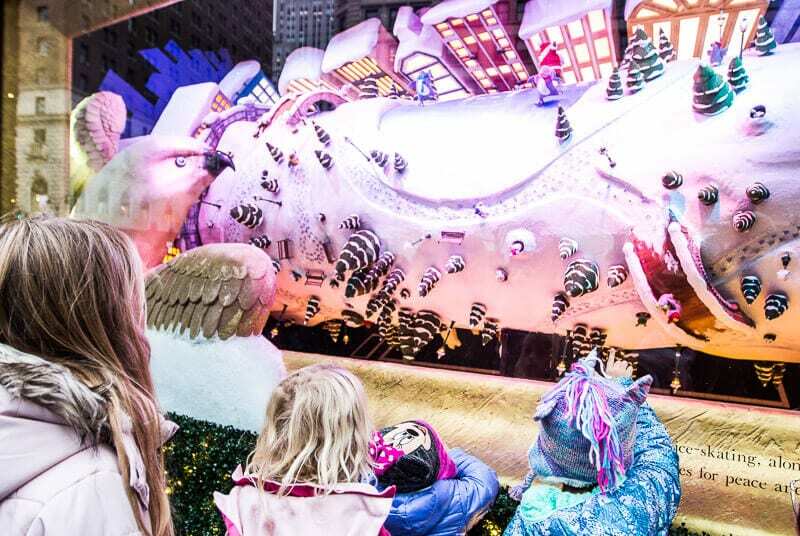 Thanks to our community for this tip to experience Santaland at Macy’s Herald Square, which has been a NYC tradition since 1902. As lines to see Santa are so long at Macy’s, you can only experience Santaland now through an online reservation. We booked ours for 3:30pm on a Wednesday and we had a very small line. Santa’s elves are good at moving it quickly. We returned to Macy’s on the weekend, and the line was ridiculously long. So try to go midweek if you can. 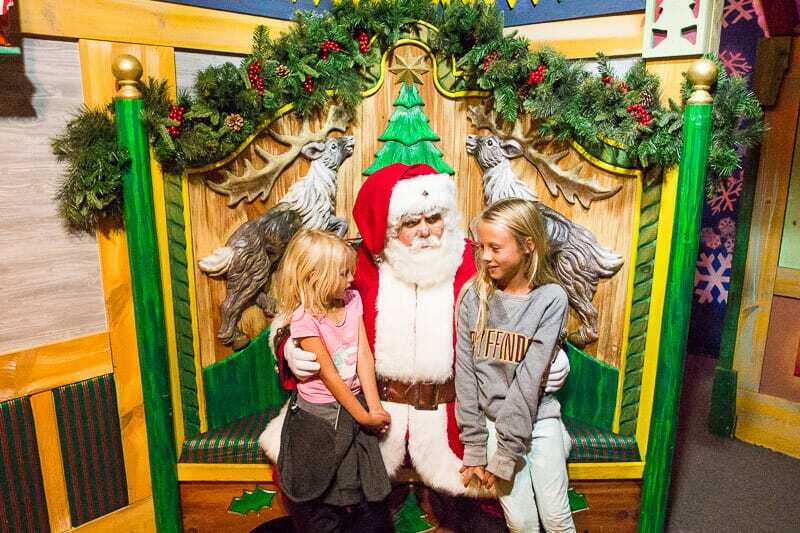 Santaland is a winter wonderland path to Santa Claus’s lap. 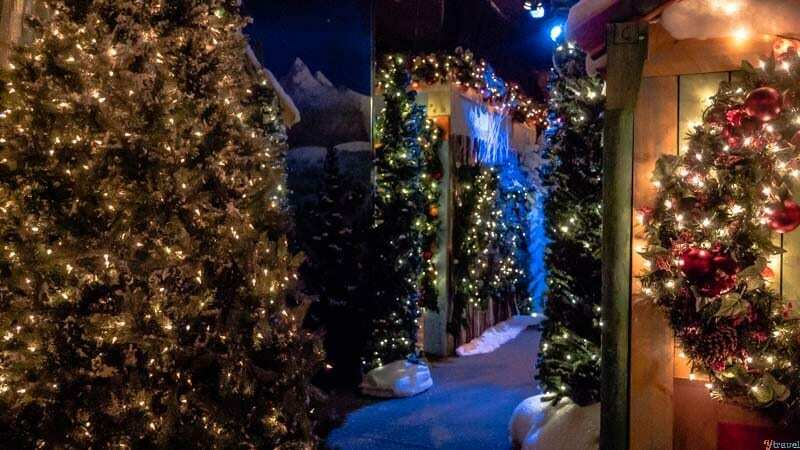 You’ll feel like you’ve entered the North Pole as you pass by twinkling lights, Santas workshop, and a forest of pine trees to arrive at the throne of the most Santa looking Santa I’ve seen. He was immaculately groomed and had a warm melodic voice and laugh. I almost believed he was the real deal. He did request cookies and milk, although I suggested to the girls he might get so sick of it that we best get him something different like a beetroot chocolate cake and red wine. Around NYC you’ll find popular Christmas markets. I saw the same stalls at some of them so you may not necessarily have to visit all of them to discover what is so unique to them. But they do also differ in some regards, especially in spirit. My favorite ambience was definitely the Winter Village at Bryant Park. But, I found better shopping at the Columbus Circle Holiday Market at the edge of Central Park, including free hot chocolate, yummy mushroom empanadas, and hot apple cider! It’s not just the Christmas markets where you may wish to do your Christmas shopping. 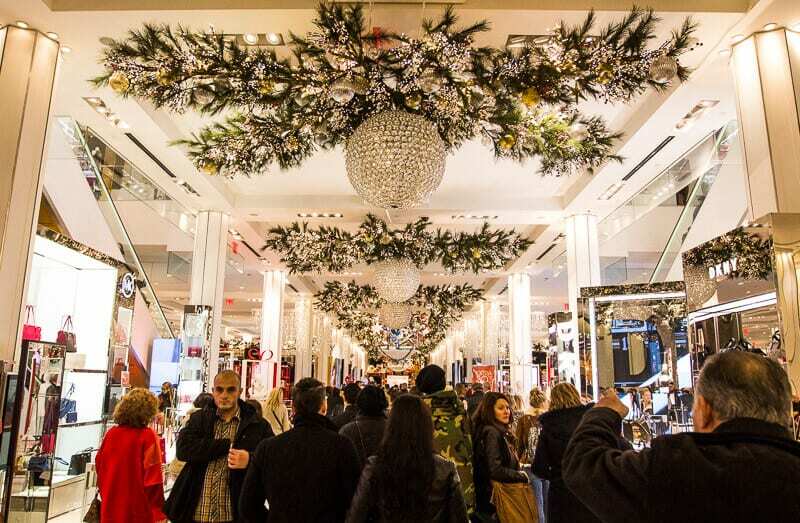 New York is the place for shopping at any time of the year, but at the time we visited – just after Thanksgiving – there were killer deals still happening, especially at Macy’s. We picked up some cheap winter coats for us all saving nearly $200 and the pretty dresses that the girls wore to The Lion King Broadway. 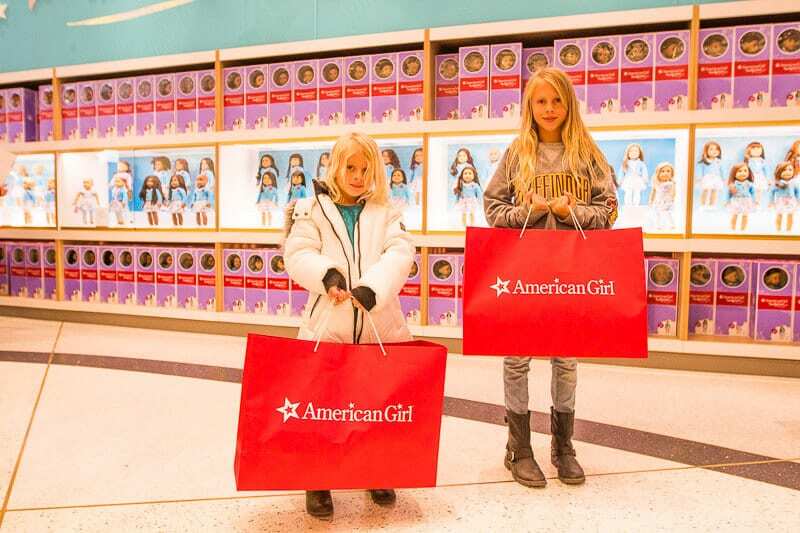 They also picked up an American Girl Doll each for Christmas from their Nan and Pop. I don’t think there will ever be specials on those things though as they are always in high demand. If you are an AMEX card user, be sure to check your offers before you go shopping. I managed to collect triple points AND another $15 off at Macy’s with an offer. And our helpful Macy’s attendant told us that if you check Macy’s online for their current promo codes, you can actually use them in store. Just tell the cashier. Saved another $50 doing that!! Leave room in your suitcase if you want to do some Christmas shopping in New York. Thankfully, we were road tripping so had plenty of space. 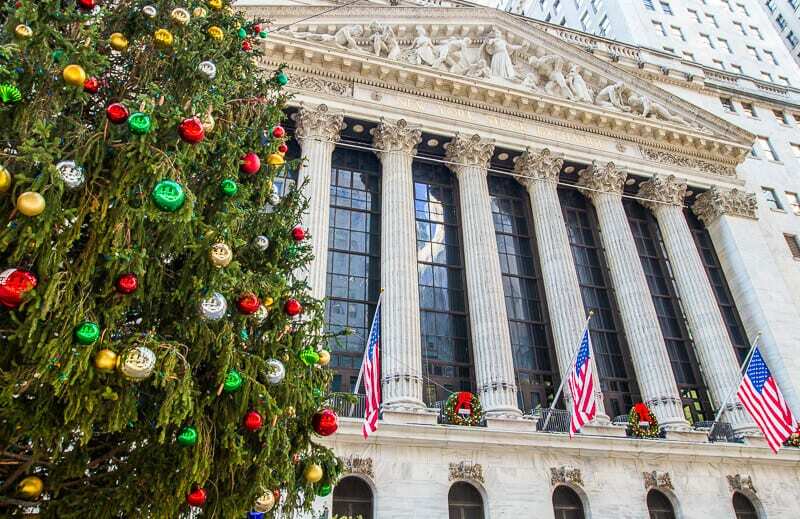 One of the most popular things to do in New York at Christmas is to see the Christmas tree and holiday displays at the Rockefeller Center. We did not spend much time in this area as the crowds were freaking nuts, especially on weekends! We attempted to visit for the lighting of the Rockefeller Christmas tree, but could not get close, only making it to a few streets back from Rockefeller before we were turned away. They had a million people show up. How they fitted in that many people I will never know? The crowds were so crazy that we lined up for 15 minutes (in a shoulder to shoulder mob) just to cross the street. 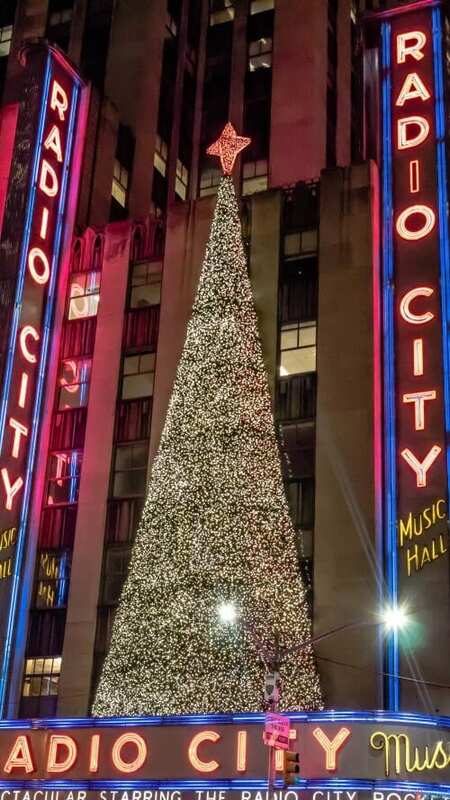 It was the same when we returned on the weekend to see the tree and the Christmas lights display at Saks 5th avenue. Abort Mission. Craig returned mid-week when myself and the girls were at The Lion King. The crowds weren’t as bad and he did get to see the Christmas tree and displays. The Rockefeller Christmas tree remains lit through the first week of January. You can also ice skate at Rockefeller Center, but you could have a long wait and it’s the most expensive of the ice skating rinks in New York City. It is also timed. Seriously, the crowds here are insane, I don’t recommended it. No trip to New York during Christmas is complete without a little bit of window shopping. The retail stores, particularly along 5th Avenue (the best shopping street in New York if you have plenty of money), go all out with their Christmas displays. Saks on Fifth Avenue is the most famous and they knocked it out of the park this Christmas (2017). Their window displays were all inspired by Snow White in celebration of its 80th anniversary. On the sides of the building the window displays features Snow White interpretations from some of the world’s most famous designers. The front windows showed scenes from Snow White. On the front of the building is an extravagant timed light display which is what everyone attempts to see in the evening. The light display is on every 10 minutes and runs for about 4-5 minutes. 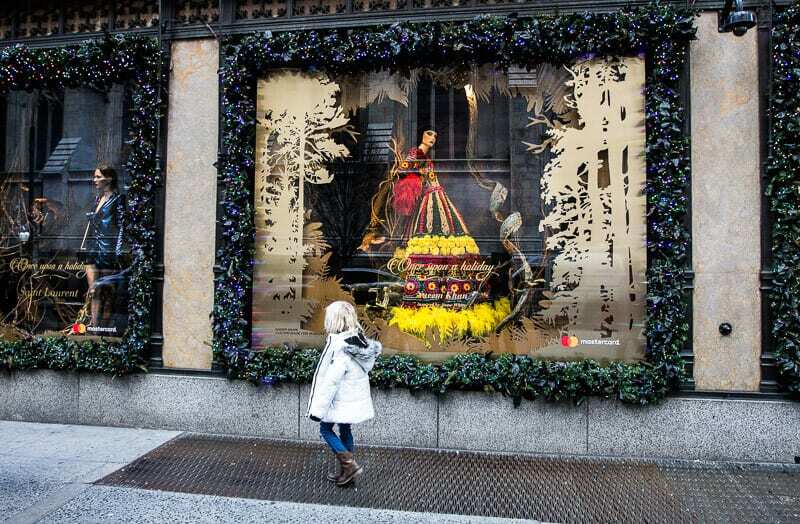 Bergdorf Goodman is another popular one for Christmas displays. 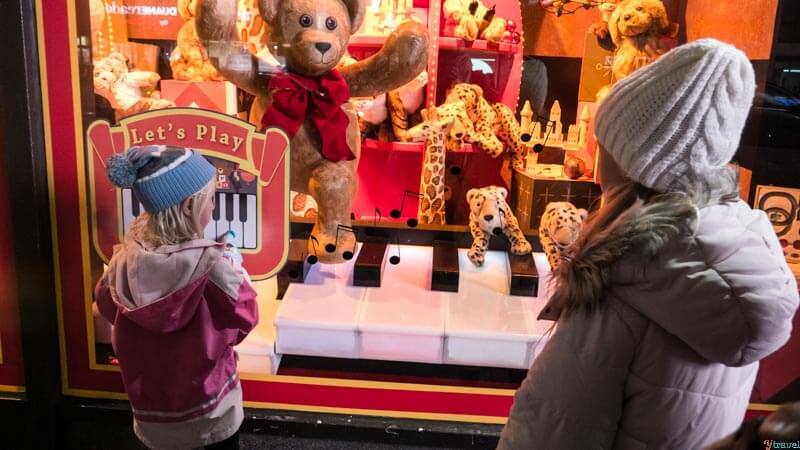 As is the iconic Macy’s, which had interactive things like looking through binoculars for close ups of the minute dolls on display, and playing the piano on the window which made music and the bears move in the window display. Super magical for the kids. Just when you think you’ve seen everything there is in travel, along comes something that is so unique and entertaining – only in New York. We finished our holiday in New York with the super fun The Ride Experience. You can do The Ride at any time of the year, but from November to early January, The Ride is a Christmas holiday experience. 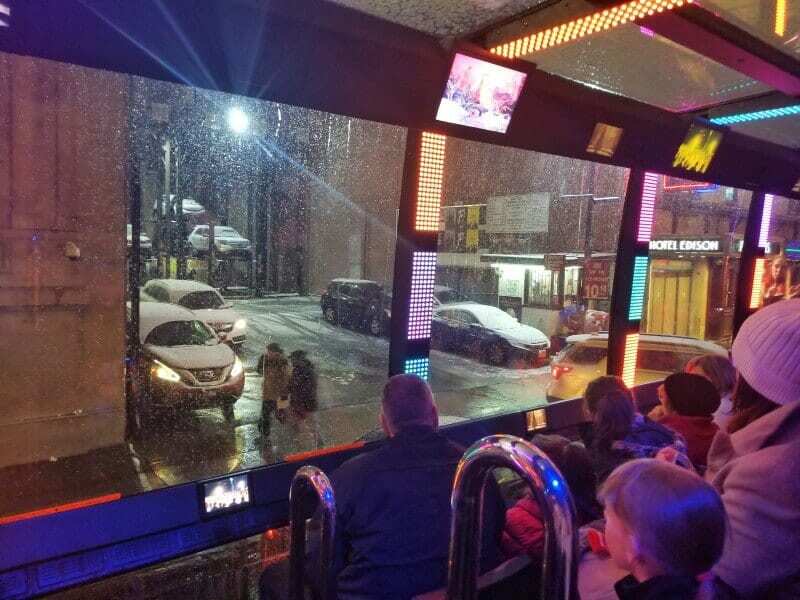 The Ride is a motor coach decked out with theater seats, floor-to-ceiling windows and flashing lights that takes you around the city so you can witness New York City’s holiday festivities and cheer and live street performers. It’s hosted by two New York City experts and entertainers and is a high energy fun experience. We loved it, especially the rapper who was ad libbing with random strangers passing him on the street. Super cool. Good news – The Ride is one of the experiences offered on the Sightseeing Pass. Read our review about the Sightseeing pass here. Okay, so this one you have no control over. It snowed when we visited in 2004 and it snowed on our last day of this visit to New York City with the girls. They were delighted and wanted to spend the entire day gathering snow from the ground to throw at us. It was their first time experiencing snow (well that Kalyra can remember) and it made New York even more magical for them. 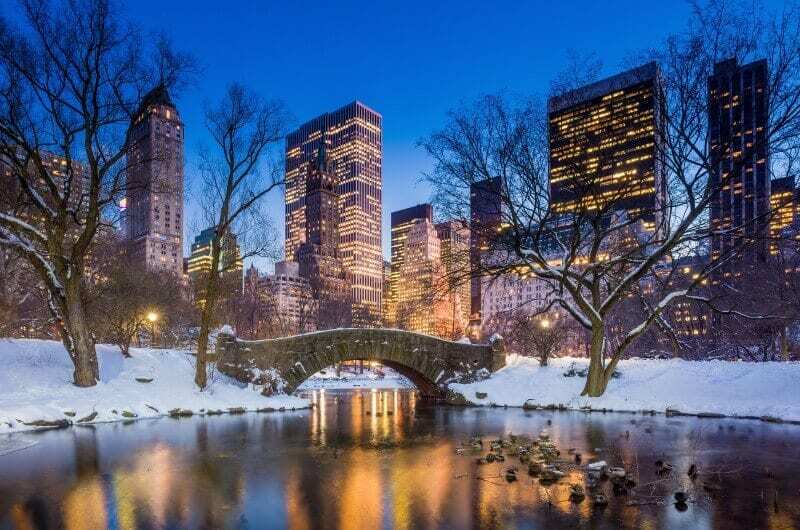 If it snows, we recommend getting out to Central Park to witness the ethereal beauty of it. We had a full day of tours booked so couldn’t get to Central Park, but we thought the 911 Memorial was really beautiful dusted in snow. And we also had lunch with friends in Murray Hill and loved watching the snow fall out the window. And then walking around it with snowflakes falling everywhere was really cool until it melted and you ended up really cold and wet. Even though we had two weeks in New York, we still did not have time to see and do everything. You always have to leave room for later right? Our community is the best. 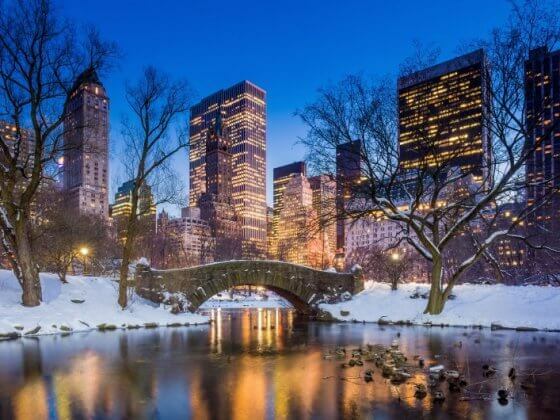 They always give us amazing tips on things to do in a region so we trust the following recommendations we had from them to experience Christmas in New York with kids. Here are some of their don’t miss New York at Christmas experiences. The Rockettes is a famous show in New York featuring high kicking dancers in the iconic Radio City Music Hall. The Rockettes Christmas Spectacular is a New York City musical tradition. This is likely to sell out so get your tickets online here. You may also find cheaper tickets once in New York. I saw dancers handing out coupons on the street. Many people recommended Rolf’s Bar and Restaurant on 22nd and 3rd as a place to eat at Christmas due to its elaborate Christmas decoration and light display. It’s meant to be a New York institution with great German food and schnapps to match! That’s the kind of Christmas spirit we love. Check out reviews here. During the Christmas holiday season the New York Botanical Garden lights up with its collection of enchanting model trains that chug along a nearly half-mile track by 150 miniature NYC landmarks like the Empire State Building and Radio City Music Hall, all made of natural materials such as leaves, twigs, bark and berries. 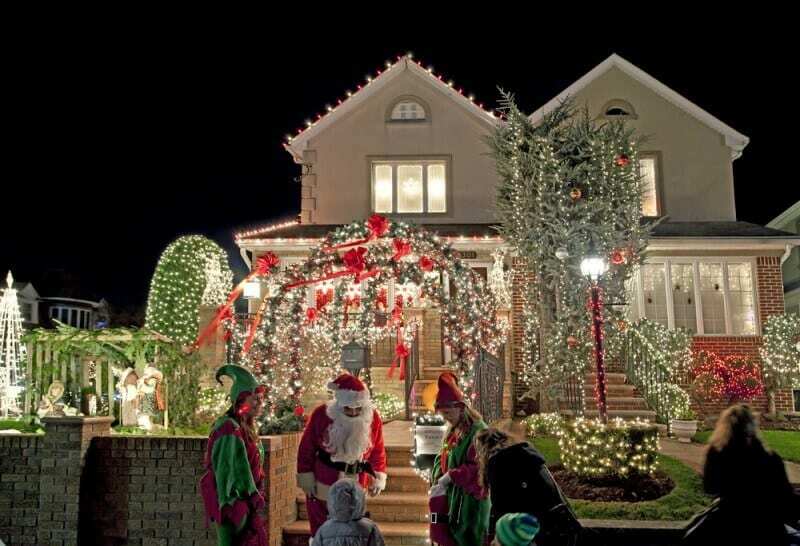 Take a trip out to Brooklyn to visit the famous Christmas lights of Dkyker Heights. It’s a great opportunity to see how the locals dress up their homes for Christmas. It’s meant to be over the top with inflatable Santas, Christmas carols and mind glowing light displays. Over 100,000 people visit each year! Each year, over 100,000 people flock to the Brooklyn nabe to witness some of the most over-the-top Christmas lights we’ve ever seen­—think huge inflatable Santas and snowmen, and houses that blast Christmas carols from loundspeakers. There is a lot of ground to cover, as many houses in the area participate over multiple blocks and avenues. If you’re traveling by subway, take the D Train to 71st St, Brooklyn. You can join a Dkyker Height’s Christmas lights tour. Check out our partner, Get Your Guide for tickets. Experiencing the Christmas holiday season in New York has put me in the mood for Christmas. We’ve returned home and purchased Christmas decorations, a live tree, and have the carols on as we decorate and make Gingerbread homes. This is so not like me! Thanks NYC. It’s beginning to feel a lot like Christmas! We spent Christmas Day in New York in 2004 with friends in Chinatown! I think that is where a lot of people go as not much else is open for lunch, unless you pay $$$$. The streets were very quiet. There were other things on in the city, but on our limited budget, we couldn’t afford to splash out on a fancy lunch celebration. We had the Sightseeing Pass and got a lot of value from that. It has the OneWorld Observatory entry (New York Pass doesn’t) but it doesn’t have the 911 Museum entry, which The New York Pass does. It just depends on what you want to see and do on the pass, so evaluate both carefully to find the best one for you. I do not recommend experiencing New Years Eve at Times Square, especially if you are traveling with kids. Watch it on TV instead from the warm comfort of a bar, restaurant or your accommodation. Or find some friends having a party. Seriously. 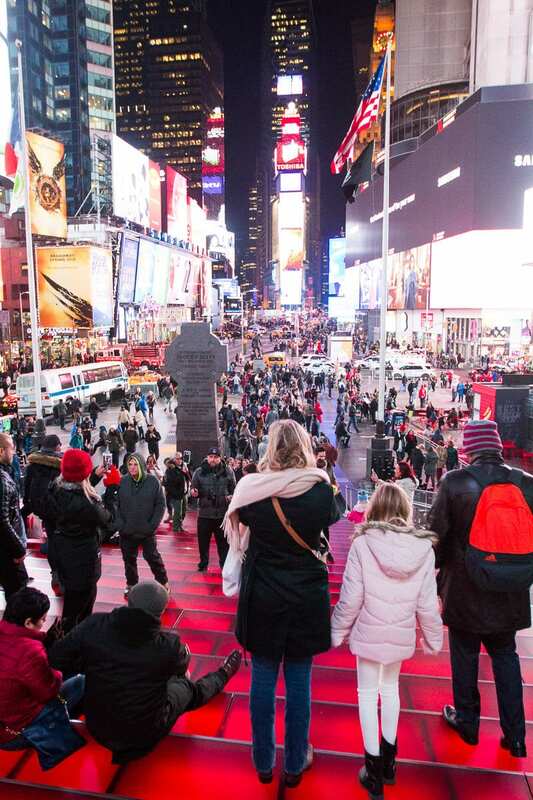 This is Time Square for New Years Eve – 6 hours crammed into a small space with a million or more people with no food, drink or access to toilets in the freezing cold. I couldn’t think of a worse travel experience, and in my opinion, would result in an uncomfortable, regretful memory. Thankfully, we had a friend of a friend having a party we were invited to in 2004. Now that was an amazing memory. We had other friends who went to Times Square and hated it. 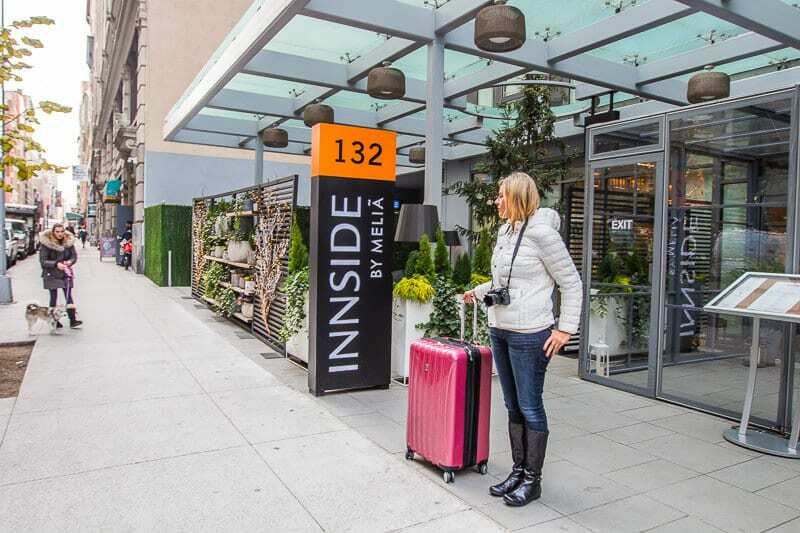 We LOVED the INNSIDE New York Nomad by Melia. I had never heard of this chain before (and we did stay at the hotel sponsored by them) but I was super impressed with it for New York accommodation. It had the best location in Chelsea – outside of the crazy tourist Times Square Area, yet central enough to walk there (15 minutes) or jump on the subway (at the corner) or walk to Penn Station. Chelsea is a fabulous neighborhood worth exploring, which also gives you easy access to the Chelsea Highline and downtown Manhattan. The INNSIDE is only 8 months old so the furnishings are very modern and stylish. It had such funky, crisp and clean décor. The most exciting feature, especially for families, were the spacious rooms. It’s hard to find space in New York, but the INNSIDE does it well. We had the family suite which was adjoining rooms. So the girls had their own space to chill out and watch Disney channel on the rare downtime moments we had. And although we didn’t have skyline views, I actually quite liked the local living views from our room. I love traveling like a local so this helped me get that feel. 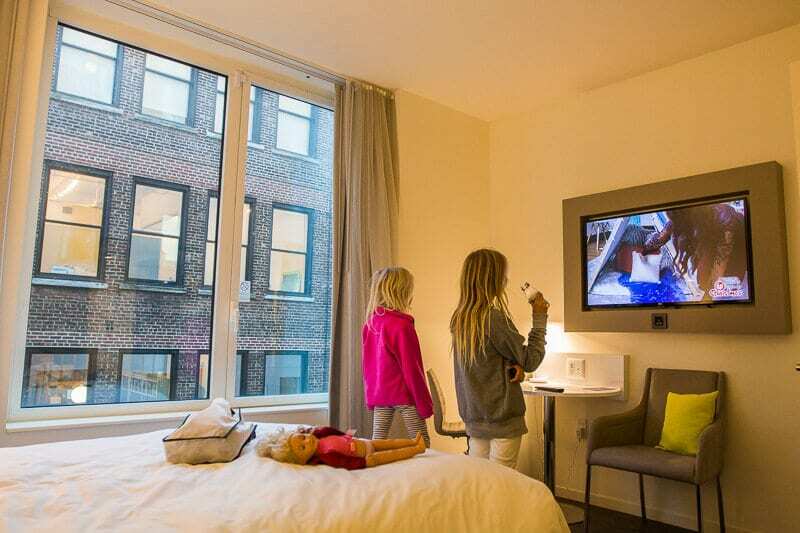 Read our review post on Innside New York Nomad hotel. And you can book a stay here. We also stayed with friends in Brooklyn, which is a good option for Airbnbs. Just make sure you find one close to a subway into NYC. New York accommodation is going to be expensive wherever you go so be prepared and try to find the best value you can. We recommend getting a subway pass. You can get a 7 day unlimited ride pass for $32. One trip on the subway costs $2.75. If you are going to use the subway a lot, and are only staying a few days, the unlimited pass still might be worth it. Savannah (6yrs old) didn’t need one, apparently it goes my size not age. If they can fit under the turnstile they won’t need one. You can also use the unlimited pass on the buses. The best way to get around New York, if you can, is to walk. The grid system makes it super easy to find your way around and there’s always something to look at in New York. Kalyra and I would never have witnessed the man roller balding through the chaotic New York traffic while lifting hand weights if we didn’t. I love New York, it’s all kinda crazies. I had the unfortunate pleasure of being the driver when we first arrived in New York. Driving is freaking madness. I was totally stressed. There is a hundred things happening in rapid fire motion. Join the locals and beep as loud as you can and force your way in everywhere. Catch an Uber or yellow taxis if you need to, but usually you won’t. It’s way faster on the subway. 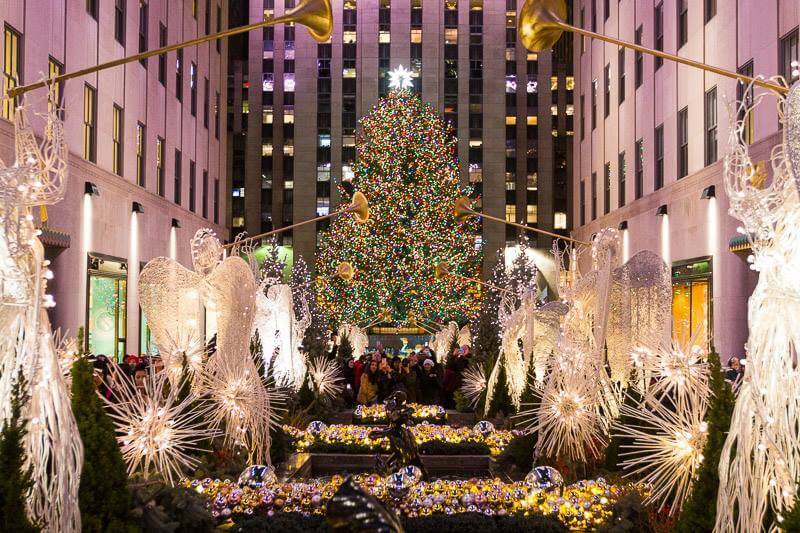 What are your favorite things to do in New York at Christmas? Very cute! And excellent tips. Thanks for including the New York Botanical Garden’s Holiday Train Show! We love NYC. 12 days is never enough! 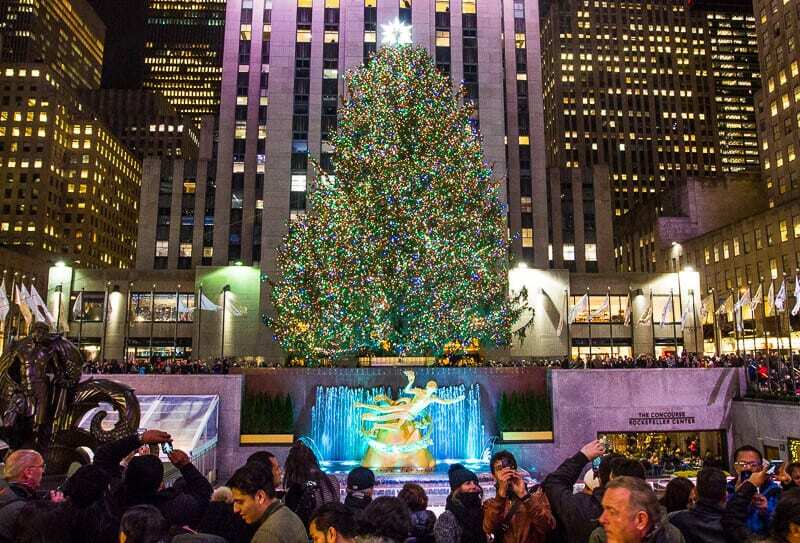 Especially this time of year with so many amazing things to do in New York at Christmas and in the new year. We’ll be back!! 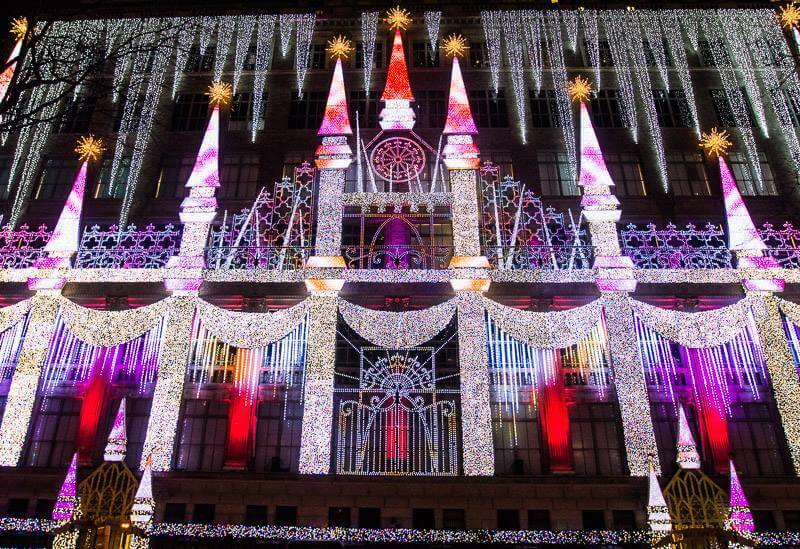 The Christmas lights in NYC are just amazing, and I love those fancy department stores and all their decorations.. I used to live near NYC as a kid and we’d take the train into the city…excellent memories of what I think is one of the coolest cities in the world. Definitely a place to experience at the holidays with kids. New York is somewhere we discuss taking the kids at Christmas as it would be amazing to witness a white Christmas in such a magical city. I will be saving this post to hopefully use in the future! Hi Sharee, New York at Christmas is magical. It’s incredible any time of year but especially during the festive season. Hope you make it there. I loved your article. We have just booked for 3 weeks in New York from the 29th November 2018. I know its early planning! Your article has given me so much inspiration. Although my two girls are older (16 & 14) than your two, I’m sure many of these experiences as great for children of any age. We were thinking of splitting our accommdation to cover two different areas. Thoughts? You could do that although Manhattan is super easy to get around so it doesn’t really matter where you stay unless you wanted to stay and experience one of the Boroughs. We stayed in Brooklyn for awhile but we were always coming back into Manhattan anyway. I’d see what kind of deals you can get. Sometimes it’s cheaper and less hassle to stay in the one hotel. Lovely city, lovely family and well done journey. Inspiring blog post! This is great. We are headed to NYC dec 14-20 this year. I want to do so many things but many take standing in line and dealing with crowds. I’m not a big fan of that. You give some great alternatives. Thank you.